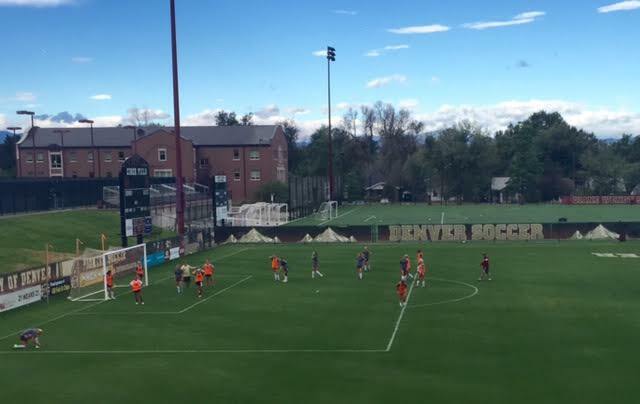 The final two weeks of the regular season are critical for DU's men's and women's soccer teams. The women's team will be battling for their playoff lives. The men are looking to clinch a conference championship and, as the only remaining undefeated team in the nation, achieve a level of success never seen in DU soccer history. The women's soccer team sits in fifth place in the Summit League. Only the top four teams make the Summit League playoffs. Teams receive 3 points for a win and 1 point for a tie. Denver has 9 points and trails both fourth place South Dakota State (12 pts.) and third place South Dakota (13 pts.). Denver finishes with Omaha and Oral Roberts on the road. Oral Roberts is second in the Summit and Omaha is celebrating senior day. Both South Dakota and South Dakota State are playing teams in the lower half of the Summit the final two weeks. Realistically, Denver needs to sweep the two games on the road and they will need some help with a Dakotas melt-down. The men finish the regular season against Eastern Illinois (last place - Summit) before heading to Ft. Wayne (2-2 Summit). In October, the Pios have played to two draws and three 1-goal victories. A decisive win against a struggling Eastern Illinois squad Saturday night at 7:00 (CIBER Field) could build great momentum and confidence before their final road game of the season. The men's Summit League playoffs will be in Denver so the table will be set for a potential plum seed and a potential home NCAA playoff match if they can run the table. The DU women, should they win both road games and get some help, would have to travel to Brookings, South Dakota for the Summit League playoffs.